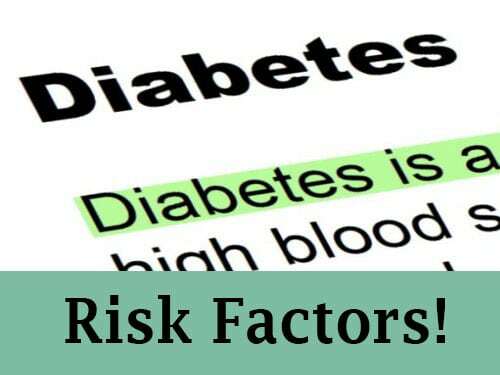 A “risk factor” is defined as anything that increases your risk—your chances—of developing a particular disorder such as diabetes. It can be important to remember that risk factors are not necessarily causal, but they are correlated. In other words, the incidence of Type 1 diabetes increases by geography—the further from the equator that you live, the greater the risk that you will have T1D. However, living in, for example, Canada, far north of the equator does not cause T1D. There is also a difference between known and possible risk factors. The known factors are backed by a large amount of evidence and a great deal of certainty in the medical and scientific communities. The possible risk factors lack the same amount of evidence and certainty, but are expected to have this in the near future, after long-term studies have been completed or after the evidence is examined and a consensus among experts is reached. Also, in possible risk factors, other influences—including known and other possible risk factors—may be involved, making the determination of the risk factor more difficult. A family history of T1D. This increases the risk because T1D has a connection to a number of genes that can be “handed down” from one generation to the next. Genetic background. As mentioned, there are a number of genes that have been described to increase the risk of T1D. T1D is said to have a “polygenic risk” because there is not one single genetic mutation or change that causes T1D. Instead, there are many (poly) genes involved in the risk for T1D. Location or geography. The highest incidence of T1D occurs in Finland and in Sardinia—the incidence is about 400 times higher than in Venezuela, a country located near the equator. Age. For T1D there are two peaks for diagnosis of T1D. The first is between the ages of 4-7 while the second occurs in children between the ages of 10-14. There are children that are diagnosed at other ages, however, these two peak ages are more common. Viruses: Exposure to a number of different viruses such as the Coxsackie virus, the Epstein-Barr virus (EBV), mumps and cytomegalovirus (CMV) may be involved in the development of T1D. The difficulty lies in the fact that some of these viruses are common and nearly everyone has been exposed to them, so it can be difficult to prove that exposure to, for example, CMV was a factor in the development of T1D. Low levels of Vitamin D: Vitamin D is made in the skin after exposure to sunlight. The problem is that exposure to sunlight has been associated with skin cancer and everyone has been encouraged to use sun screens. There are relatively few natural food sources of Vitamin D. Low levels of Vitamin D may be associated with T1D because it is an autoimmune disease and Vitamin D plays a role in the development and functions of the immune system along with other functions in maintaining bone strength and the processes of inflammation. Early exposure to foods commonly involved in food sensitivities. Food sensitivities are an immune response to constituents in food. They are much more common than food allergies, though that term is often used to describe them. T1D appears to be associated with early exposure to constituents in cow’s milk (casein), and grains (gluten). In this context “early” means before the age of 4 months. However, late exposure (after 7 months of age) has also been associated with an increased risk for T1D. Nitrates in water: Nitrates are substances containing nitrogen and oxygen and bound to other substances. Not all nitrates (or nitrites) are necessarily harmful but nitrates can be converted to nitrites in the body and by bacteria in the body—and some nitrites especially are known to be harmful. In most areas, the amount of nitrates in water is regulated. Maternal preeclampsia: Preeclampsia is a condition of late pregnancy associated with high blood pressure and increased protein excretion. Children born of mothers who were preeclamptic are at a higher risk for T1D. Neonatal jaundice: Neonatal (newborn) jaundice is generally not considered serious and reflects to some degree an immature liver. It is however, associated with a greater risk of T1D. Being overweight, particularly if most of the excess fat is carried in the abdominal area. In general, if your Body Mass Index (BMI) is over 25, this is considered overweight and at risk. Ethnic background: In North America, the risk for T2D increases for those of African, Asian, Native and Pacific-Islander background. Newly emigrated individuals from those areas have an increased risk, IF they adapt a western-style diet. In general, people in non-westernized countries increase their risk of T2D as their diet and lifestyles become more “westernized”. Other medical conditions. This includes Polycystic ovary syndrome (PCOS), a history of gestational diabetes, high blood pressure and high blood triglycerides (blood lipid or blood fats). In addition, if you have impaired glucose tolerance or prediabetes, you are at a higher risk for T2D. Personal History. If you have prediabetes or had gestational diabetes in previous pregnancies, your risk is increased. Also, if you have previously delivered a baby who weighed more than 9 pounds or had an unexplained stillbirth, you are at a greater risk. Being overweight. Women with a BMI over 30 (defined as obese) have a greater risk of gestational diabetes. Ethnic background. African, Native North American and Asian women are at greater risk of gestational diabetes as compared to women of other ethnic backgrounds. To date, the gene that is most strongly associated with AD is called the apolipoproteinE-e4 gene (APOE-e4). There are three different forms of APOE, but only APOE-e4 appears to be associated with AD. Everyone inherits one gene from each parent. If you inherit one APOE-e4 gene from one parent, your risk for AD increases. If you inherit the APOE-34 gene from both parents, your risk is higher. Other genes that have been associated with AD include the genes that code for 3 different proteins; amyloid precursor protein (APP), presenilin-1 (PS-1) and presenilin-2 (PS-2). Head trauma: A history of head trauma increases the risk of AD. Cardiovascular disease: Diseases of the blood vessels or that affect the blood vessels can increase your risk of AD. These include high blood pressure, diabetes, high levels of cholesterol and triglycerides. The main risk factor in MODY is genetics—MODY is a monogenetic disease, meaning that if you inherit a single gene that causes MODY, your risk for MODY is much higher. That inheritance of a single gene is the only known risk factor. There are some risk factors that you can’t control for in T1D, T2D, gestational diabetes or AD. You can’t control for your age, your genetics or your ethnic background for example. There are some factors over which you have limited control—whether you or your child are exposed to viruses, for example. Then, there are those risk factors for diabetes that you CAN control for yourself. These include diet and exercise—and your weight. The dietary factors that are most important in diabetes and weight control are added sugars. These added sugars come from mainly processed, refined and fast foods. The first step in controlling the dietary risk factors is to avoid processed, refined or fast foods as much as possible and eating only whole foods—those foods most like their natural state and unprocessed. This includes whole grains such as wheat (except in individuals who have gluten sensitivity), buckwheat, quinoa, millet and brown rice. If you do have gluten sensitivity, avoid wheat, barley, rye, triticale and some oats (unless they are produced in a gluten-free facility). Increase the amounts of vegetables and fruits in your diet. Increase the amount of fish and lean poultry (chicken, turkey, game hen, game birds) in your diet and avoid red meats. If you have grass fed lean beef once or twice a week, that is fine because grass fed beef has normal ratios of the omega fats. (High levels of omega-6 fats is associated with inflammation which will make weight loss difficult and can make diabetes worse or harder to control). Include nuts and seeds in many of your meals. Avoid any packaged, processed, refined, pre-made or fast foods. These types of foods have added sugars and preservatives with unknown and often unstudied effects. Avoid candies, pastries and baked goods as well. The important thing to remember with exercise and movement is that just about anything—if you want it to—can turn into increased physical activity. You can walk, run, dance, swim, do yoga, do tai chi, play team sports, play sports on your own or with a single partner, garden, mow the lawn, jog, hike, bicycle, use a rowing machine and even do housework to increase your level of physical activity. It doesn’t have to be at a gym, though at times, going through with a gym membership can help you get motivated. The idea is to increase physical activity by doing something that you enjoy! Aerobics, for example, is not for everyone. If that’s not for you, maybe swimming or a dance group will be more interesting. To increase the amount of walking you do, park further away from the store or the office and walk briskly to get to wherever you are going. Instead of taking the elevator, consider using the stairs at least partway! If you start to think about it you will likely find lots of ways to increase your activity level. Any amount of increased physical activity level will benefit you—the more, the better for you! Start off slow and easy and work your way up—and don’t forget to stretch, warm up and warm down. Changing your dietary and exercise patterns can make a significant difference in both preventing and controlling diabetes. Skin infections (bacterial and fungal) and skin diseases such as acanthosis nigricans, dermopathy, Necrobiosis Lipoidica Diabeticorum (NLD), Diabetic Blisters (Bullosis Diabeticorum), eruptive xanthomatosis and others. Keeping tight control over your blood sugar levels through diet, exercise and any prescribed medication is the best way to prevent these. Eye complications that can occur include glaucoma, cataracts and diabetic retinopathy. The best way to prevent these complications is by frequent and regular checkups and by controlling your blood sugar levels through diet, exercise and any prescribed medication. Nerve complications (neuropathy) are believed to be caused by high levels of blood sugar—the glucose in high concentrations acts as a toxin for nerves. Again, the surest way to prevent neuropathy is by controlling your blood sugar levels through diet, exercise and prescribed medications. One of the complications caused by neuropathy are foot ulcers, calluses, skin infections and skin changes. Often, people with diabetes are unaware of these changes because the neuropathy decreases the sensation of pain and changes in temperature. Controlling your blood sugar, exercising to help maintain good blood circulation and seeing a podiatrist regularly can help prevent these complications. Kidney complications and kidney disease (nephropathy) occur because high levels of blood sugar “tax”the kidneys and make them work harder. High blood pressure and stroke can be prevented or mitigated by the dietary and exercise approaches outline—but, in addition, blood pressure may need to be treated with medications—taking the proper medications can control blood pressure and help prevent stroke. If you liked this article share with anyone who is interested in this topic.